The party is the reward you give yourself, the carrot at the end of the planning stick, if you will. The logistics of almost any wedding will drive most people a little crazy if they think about it too hard. When I arrived at the Ecotrust that afternoon, I encountered a stressed out Matthew in the parking lot. He was nervous about so many things. He improved remarkably when Suzanne swept into sight but it wasn’t until after the ceremony and a walk with her to do some portraits that I started to see him come back into balance. These two are made for each other and watching them come to life at their great party was a treat! So do the homework and get a good night’s sleep. All that’s left is to get up on your wedding day, take the test and then party like you mean it! Kudos to the planners from Soiree… always a professional team! This entry was posted in Wedding Posts, Weekly Favorites and tagged Ecotrust, party, portraits, soiree, wedding day on October 20, 2015 by admin. 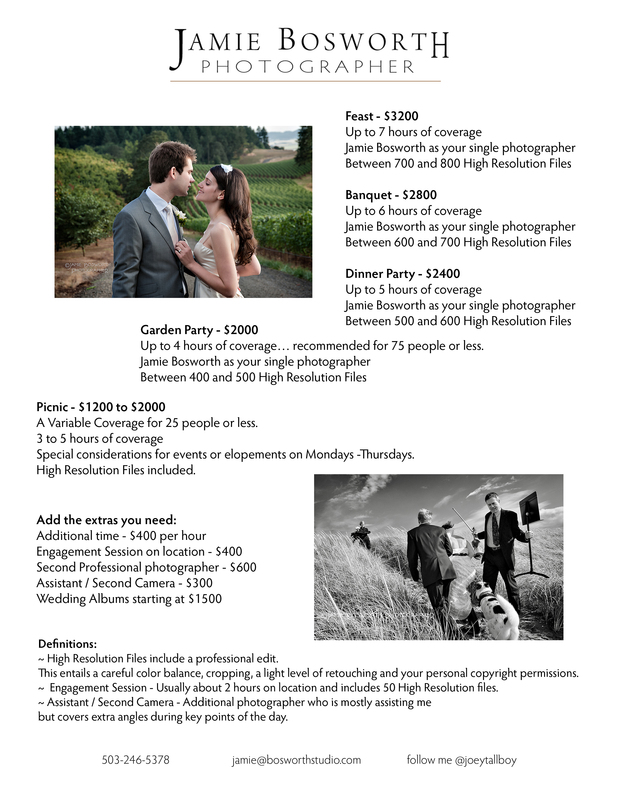 All of my wedding pricing is available here… please let me know if I can answer anything in particular. The investment for most weddings ranges from $2000 to about $6000 depending on the level of coverage and the extras you choose. I also offer some very intimate coverages because many people these days aren’t doing the big parties. If your perfect wedding is a sweet, small affair or if you want to elope, anything can be tailored for a better fit… it’s worth a meeting or a good conversation to see what we can do, ok? In most cases it takes about 6 hours to cover a regular wedding gracefully…keeping in mind that the photographer should be there from about the getting dressed time to maybe a little more than halfway through the party…as long as there is still a story to tell. I am offering coverages based on time and me as your photographer. In an attempt to make it easy for you to build a package that fits, there is now a list of extras that you can add to the coverage as needed. In any case, the most important thing is to have great pictures taken. The variable retainer is $500 or $1000, depending on the coverage you choose… if you think you might want to do this I’d recommend a sit-down to see if we connect across the table. I honestly believe that these relationships are based on three points… style, price and personality… if we are a go on all of those things, great! If not, it would be best to find out sooner than later, yes? This entry was posted in and tagged 4x6 prints, album, intimate events, Kit, minimum, options menu, party, res files, starter kit, website on February 20, 2011 by admin. Mandy was a delight to watch as she married her Marty in the low golden light at the temple… incense in the air. From there to their lovely house full of friends… the kind of intimate, relaxed party everyone likes… a little prosecco, a little pie on a sweet and simple June day. This entry was posted in Wedding Posts and tagged best wedding photographer, bosworth, class, cupcakes, dye, francoise, Francoise Weeks Florist, jamie, Jamie Bosworth Photographer, June, party, photo, photograph, photographer, Portland weddings, prosecco, sassafras, satori, sugarcube on June 28, 2010 by admin.